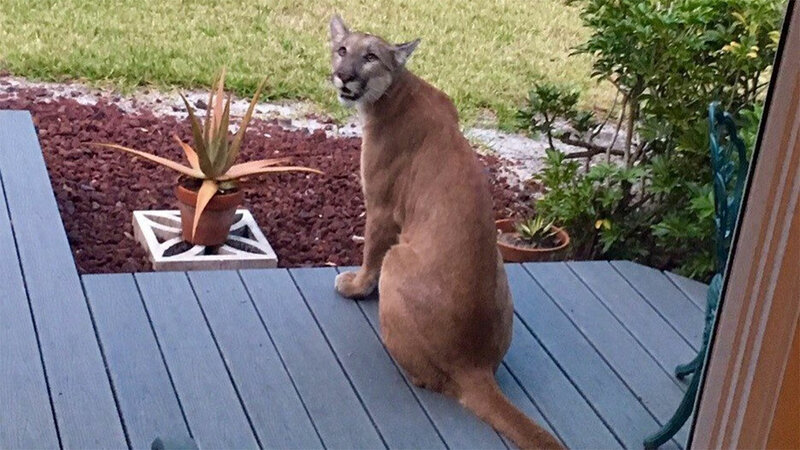 EAST FORT MYERS, FL -- It's not every day you look out the window to see an endangered Florida panther sitting on your porch! According to the Florida Fish and Wildlife Conservation Commission, Phil Hendra was at his father's house in East Fort Myers just south of the Orange River on March 18 when he took this photo of the endangered big cat. "It stayed for about 20 minutes and laid down for a bit," said Hendra. "It looked at us inside the window then slowly walked away and we have not seen it since. My parents have lived here since 1988 and they may have seen a younger panther about two years ago, but nothing compares to this once in a lifetime experience." Florida panthers are large, tawny-colored cats that grow to about six to seven feet long. Males weigh as much as 160 pounds. Biologists estimate there are about 100 to 180 adult panthers in Florida. Citizens who spot them are encouraged to report the sightings to help with conservation efforts.